Our intranet searching functionality ensures that your staff can find the information they need easily and rapidly. 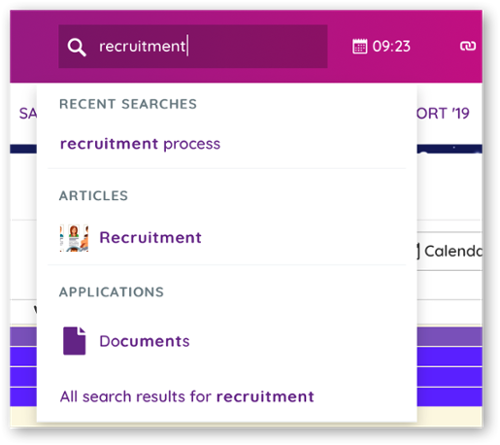 Furthermore, intranet administrators can continually tweak intranet search results to enhance their users’ intranet experience. If users can’t find what they’re looking for, they can submit Search Requests to their intranet administrator. These requests can be periodically reviewed and implemented to improve the accuracy of search results over time. Search results will appear dynamically when you start typing a query into the search bar, providing quick and predicted results on-the-fly. Guide users towards the content they need with our Search Recommendations feature, where you can link up common search terms to closely-related queries. Our Document Management System includes additional searching features, such as instant filtering. Enter your search query into the filter bar and see results appear instantly.